So you want to start emulating the Dreamcast do you? There are a few things you’re going to need in order to do that, on this page we’ll look at what they are and how you might go about getting them. Open the Start menu or Start screen and search for “dxdiag”. Run the program that appears in the search results. Click on the “Display 1” tab. The DirectX versions are listed under “Feature levels”. 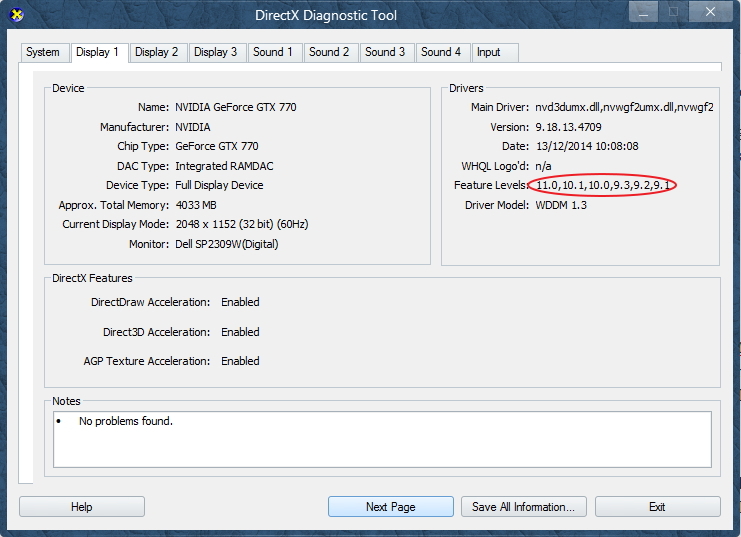 The picture below shows a card that supports DirectX 11 and 10 (click the picture to enlarge it). Your PC also needs to be fast, the faster the better. The faster your computer is, the better your Dreamcast emulation experience will be. It’s difficult to say exactly what the minimum spec of your computer should be before Dreamcast emulation is out of the question. Any Core i5 or i7 launched in the last 4 years should certainly be up to the task. Budget or mobile processors like the Intel Atom or Celeron might struggle, though some users report good results with the second generation Atom processors. Dreamcast Emulator – This is the software itself that translates Dreamcast games into something a PC can run. There are two emulators that we test against, they are Demul and Makaron. Demul is typically the best emulator to use, though a small number of games might run better on Makaron. Getting the emulators is the easy part, you can download Demul here while Makaron can be downloaded here. Note that with MakaronEX, Windows Defender will flag one of the files within the zip archive as having a virus. We believe that this is actually a false positive, but if you are concerned you can simply quarantine the file as it is only needed if you want to emulate the Naomi arcade board. BIOS Files – This is the basic operating system for the Dreamcast console. Just as your PC needs an OS in order to do anything useful, so does the Dreamcast. Finding these files is a little tricky, though some emulators actually come with them pre-installed. The legal way to obtain them is to dump them from your own Dreamcast console. There’s a video tutorial on how to do that here and some more information here. As you can see, the process is rather convoluted and so most gamers simply find a copy of the BIOS on the internet. Sadly since this is copyright software we can’t put it for download here. Unfortunately, PCs cannot read Dreamcast discs. Games – Since the PC cannot read Dreamcast game discs, you will need copies of the games you want to play. Again, the legal way to do this is to use your Dreamcast and your games and special software that can transfer them to your PC. Details of how to do that can be found here. Again, the process is quite complicated and we won’t pretend most users don’t find other ways to obtain the games they want to play, but as with the BIOS files we can’t link to them here. Optional but highly recommended – A controller – Dreamcast games are not usually designed to be played using a keyboard and mouse, so using a PC compatible game controller is strongly recommended. The Xbox 360 controller works well with most games. Got a BIOS and a game image on your PC? Then lets get some emulators set up. Follow the guides below to set up both Demul and Makaron.